There have been many accounts written about the 1996 Everest tragedy. On May 10-11, eight people from three expeditions died when trapped by a storm in the Death Zone. They either disappeared on the mountain or were later discovered frozen to death. A ninth victim, Beck Weathers, survived after being left for dead when he was unable to move on his own. His walking into camp was nothing short of a miracle. Lene Gammelgaard was one of the hikers that made the summit on that fatal trip. She was part of Scott Fisher’s Mountain Madness Expedition. Scott himself was one of the five people from the combined Adventure Consultants/Mountain Madness bid for the summit. Lene tells her story with candid prose. 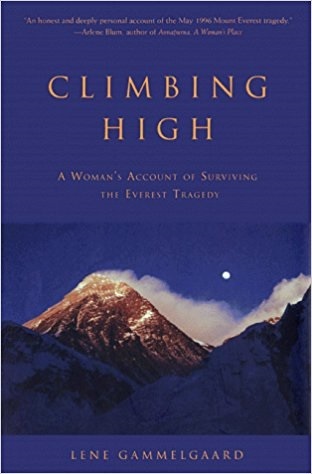 She was one of the climbers lost in the whiteout above Camp Four. Only a break in the storm for an instant saved any of them. The sky was clear long enough for one of the climbers to get a bearing from the stars. Lene was one of the climbers who staggered to safety and alerted people to others dying not far from camp. What really happened to trap the climbers is only known by the survivors. They lived the dreadful moments of being lost in a storm 8000 meters up. They knew the people who died and the horror of being able to do nothing to save them. Lene’s account is straightforward and not focused on blame but focused on survival!